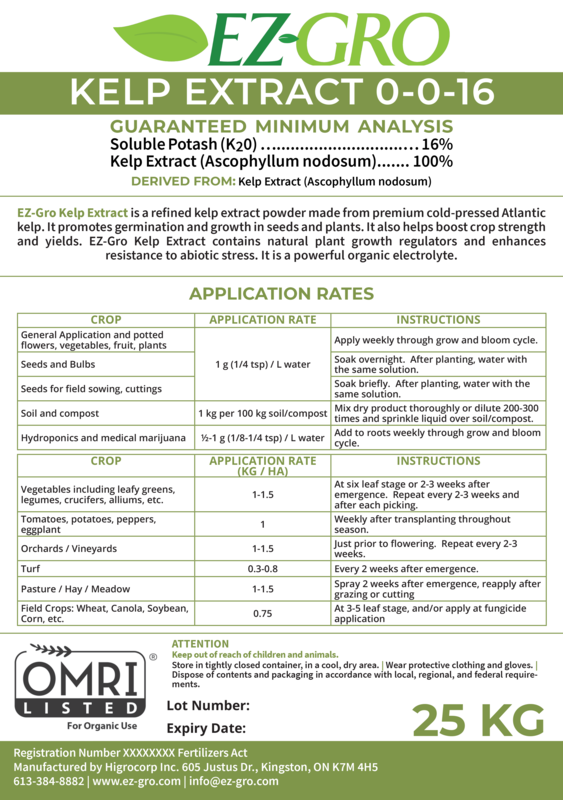 EZ-Gro Kelp Extract 0-0-16 is an organic plant nutrient containing derived 100% kelp extract and containing 16% soluble potassium. When applied in small quantities, seaweed extracts demonstrate growth­ stimulating activities. It has been shown to benefit early germination and establishment, enhance crop production and quality, and even boosts resistance to abiotic stress. The components of seaweed extract include macro and microelements, amino acids, vitamins, cyotkinins, auxins, and numerous others that work synergistically to stimulate growth and production. Finally, seaweed extracts have been associated with an increased resistance to environmental stress. Add EZ-Gro Kelp Extract 0-0-16 to your regular fertilization routine to improve soil environment and stimulate growth of almost any crop.